A goniometer is an instrument which measures the available range of motion at a joint. If a patient or client is suffering from decreased range of motion in a particular joint, the therapist can use a goniometer to assess what the range of motion is at the initial assessment, and then make sure the intervention is working by using the goniometer in subsequent sessions. The term goniometry is derived from two Greek words, gonia, meaning "angle" and metron, meaning "measurement". Goniometer have different types; the most use is the universal standard goniometer,which is either made with plastic or metal tool. It consists of a stationary arm, a movable arm and a fulcrum. Other types of goniometer use for joint range of motion measurement the telescopic-armed goniometer and some smart phone applications. 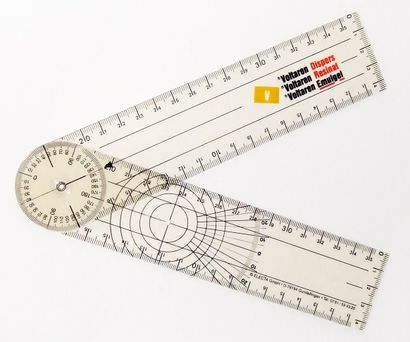 ↑ Goniometer. (2008, August 30). In Wikipedia, The Free Encyclopedia. Retrieved 11:12, September 14, 2008, from http://en.wikipedia.org/wiki/Goniometer. ↑ Milanese S et al. Reliability and concurrent validity of knee angle measurement: Smart phone app versus universal goniometer used by experienced and novice clinicians. Manual Therapy, 2014; 5: 1–6. ↑ Jones A, Sealey R, Crowe M, Gordon S. Concurrent validity and reliability of the simple goniometer iPhone app compared with the universal goniometer. Physiotherapy Theory and Practice. 2014;30 (7): 512–516. ↑ Ockendon M, Gilbert RE. Validation of a Novel Smartphone Accelerometer-Based Knee Goniometer. Journal of Knee Surg. 2012;25:341–346.